Steel palisade security fencing is provided in several different types. D Section security palisade fencing is suitable for general security. Effective against opportunist crime as well as an excellent visual deterrent. 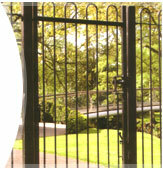 W section high security fencing is another style of palisade. This type of fencing is an extremely effective first line of defense against the more aggressive intruder. Suitable for high security use. W section palisade is stronger and more durable than D section and is a lot more effective as high security fencing. 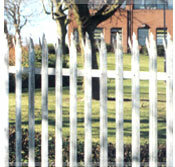 This particular style of palisade fencing has a wide variety of uses. 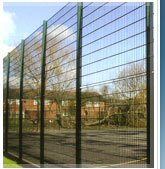 It has been used extensively in schools as a high security fence. It is preferred with such institutions because of its less abrasive look. Round and notched palisade fencing can also be used on shorter fencing where as tri-point and single-point are not recommended for safety reasons. It can also be powder coated for ascetic purposes. This style of palisade fencing is an extremely high security fence. Tri Point Palisade Fencing is primarily used on factory sites and other such buildings. Its size and shape makes it an excellent deterrent and has proven very popular. Its popularity in the commercial side has even allowed it to make its way into the residential sector. Its height can be varied to suit and it can also be powder coated for ascetic purposes. Contact Wearside Fencing for competitive quotes and our recommendations. There are also other styles of of Palisade such as pointed top and blunt top etc, more information can be provided if required. Please dont hesitate to Contact Us.